I was given two popular antennas to use for a decent amount of time. I figured to try them both out and share my feelings about each one. I was given the Arrow Satellite II from Arrow antennas and a dual band Log Periodic from Elk Antennas. We’ll look at each antenna individually and then compare them to each other. Whenever someone mentions working amateur radio satellites (reapeaters in the sky), the Arrow Satellite II is almost always mentioned. It’s been mentioned so many times that I wanted one. However like most hams, I’m cheap! If I feel that I can make the exact same antenna, I will try my best to do so. I tried looking for the plans for that antenna but couldn’t find them. I was bummed out until someone I knew (N1KXR) purchased a used one from another ham. This was the perfect time to take the antenna and dissect it. The first thing I did when I got the antenna was to assemble it and PLAY! The actual assembly of the antenna was OK. The reason it’s called an ARROW antenna is because the elements are made from aluminum arrow shafts that are used in archery. The great thing about using arrows is that they are light and built to some strict specs. I like that it’s light weight and that I can setup the antenna to either VHF or UHF or Both. The duplexer inside the handle is a big plus. I don’t have a spectrum/network analyzer or lab equipment to give you the in-depth specs of the antenna (I just wish I knew) but it shows good SWR on my bridge (meter) and it performs. The only thing I would do if this was mine is to use different color electrical tape (or paint markers) to identify the correct pairs of elements. I lined them up by height. I would also drill a hole in the handle (away from the duplexer) so I could mount the antenna to a tripod better. As I found with the PVC Tape measure yagi, It gets heavy after holding it for awhile. I wanted to make this antenna almost exactly the same way it was purchased. From using arrows shafts all the way down to the micro-duplexer that is in the handle. I didn’t want to drift far away from the original design so out came the 5ft vernier calipers and went to town remaking the entire antenna in CAD. After putting all the dimensions back into CAD this is what I got. I would like to say it’s within .005″ and the antenna is possible to reproduce if you have access to a drill press, arbor press (can’t tell if the BNCs are pressed) and lathe (Or a good fixture for the drill press) as most of the work would be focused on the driven element/gamma match. Is it worth making your own? Even though I have access to some of the material, I wanted to look at as if I had nothing and had to go out and buy all the material. So I started calling around for quotes on material. The more and more I got into it, the price kept climbing and climbing. Let’s start off with the Arrows. I wanted to use the same aluminum arrows just like the ones that are used on this antenna. I went looking for the Arrows they used based on the dimensions I got from reverse engineering. While trying to find these arrows I learned a lot about all the different types of arrows used in archery. When it comes to aluminum arrows, they use a 4 digit number system. The first two digits are the diameter of the shaft in 1/64″ increments and the last two digits are the wall thickness in 1/1000″. I found out that they are using 1716 arrow and the only ones I can find are by Easton (Easton Blues/Jazz) and they are not cheap. Just the shafts would end up being $60-$70. That doesn’t include the 8-32 Inserts. The tubing, square stock and bar stock for the boom and gamma match would add up to approx $30. BNC connectors, Coax, plastic tubing, wire, screws and threaded rod would add up to approx $20. So far we’re looking at least $100-$120 for the material and that doesn’t even include the micro duplexer. 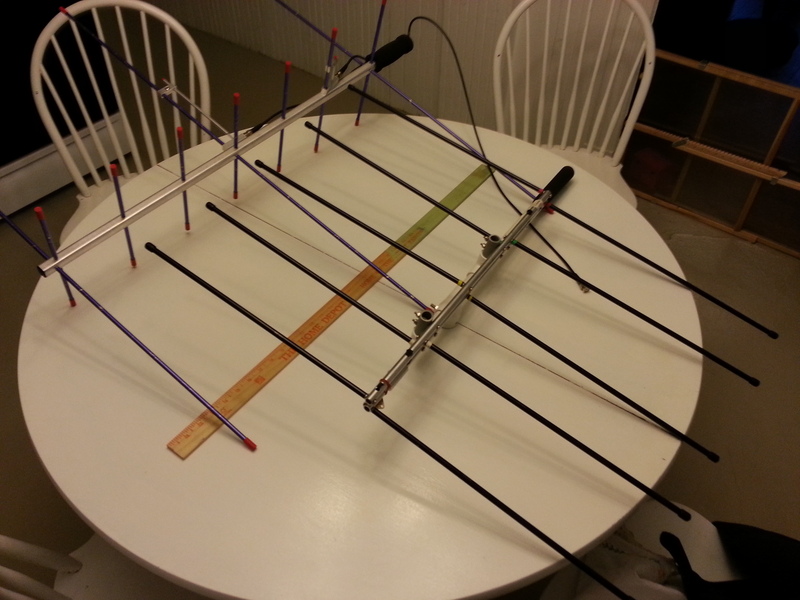 You can purchase the duplexer ready to go from Arrow Antennas for around $60 or you can make it yourself using the plans found on KI0AG’s Site that appears Arrow Antennas used as well. If you don’t have the means or equipment to make/etch your own boards then it will still cost a decent amount of money. For me, It’s not worth building. The price of material would meet or exceed the cost of the antenna if you were to buy it from Arrow. This doesn’t include the splitboom, duplexer and labor involved. As much pride as I take in building my own, it’s not worth it. I can buy the antenna already made for less then it would take to manufacture. I tried things like using 1/4″ solid aluminum rod to reduce the materials costs but now you are spending more time in labor in drilling and tapping for a 8-32 screw. A lathe would really help in this situation. I can’t get too technical because I don’t have any of the testing gear or the know how to give you exact figures. The following evaluation is just from my personal observations. The way I received the antenna was in a tube with what appears to be the original plastic bag that separates the UHF and VHF Elements. Since this antenna is used, I am not sure how it comes from the factory. Assembling the Antenna is quite a challenge. The elements are NOT labeled! 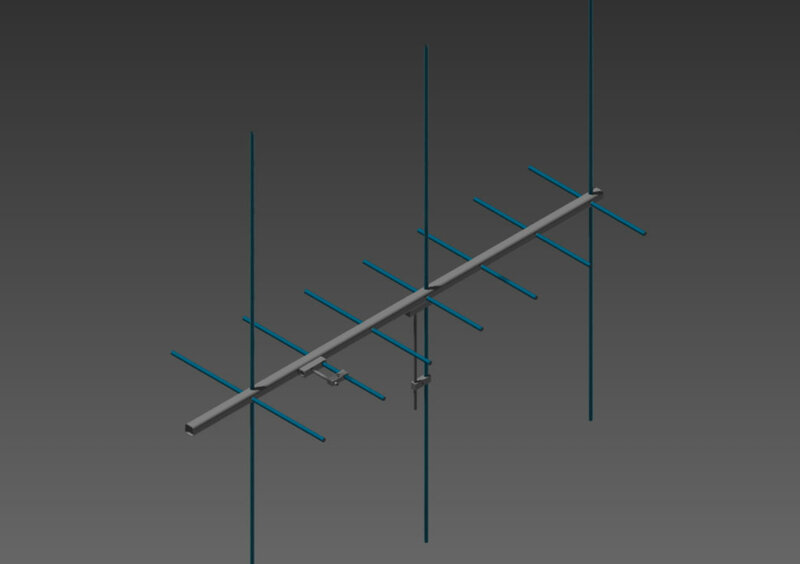 What I had to do was line up the elements by height and pair them together for both the VHF and UHF side of the beam. For me, most of the time assembling this antenna is spent finding out which element is which. This would be my only complaint about the antenna. However it can be fixed by doing a couple things. Buying multicolored electrical tape and put some tape on the elements and boom. 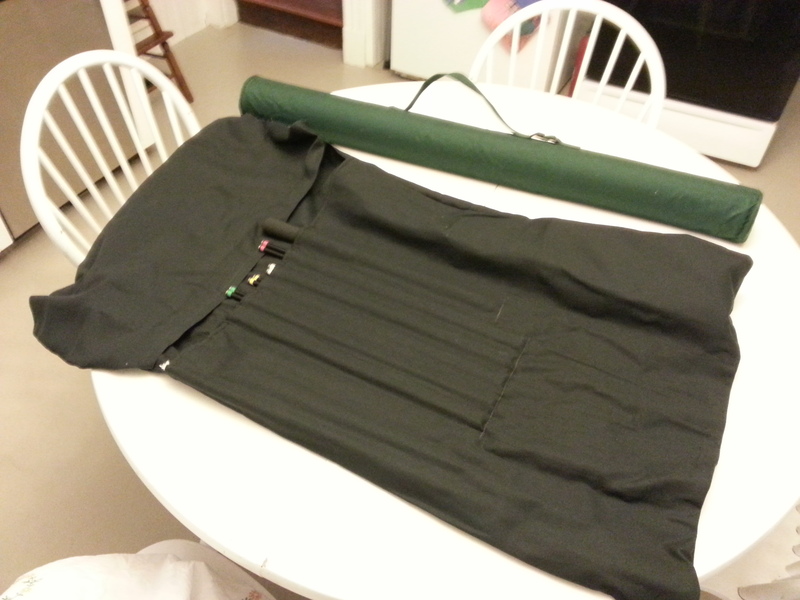 You can also purchase or make your “Antenna” bag with pockets for each pair of elements. Assembly is pretty much straight forward once you know what goes where, Just screw them together through the boom, hook up the BNC connector and you’re ready to go. I’d suggest the first time you put it together to check SWR and adjust the gamma match for optimal SWR. I spent some time tracking Sats, hitting repeaters that I can’t normally hit with a rubber duck and some back yard RDF. The antenna performs, I was able to pickup some satellites like the NOAA and some Ham Sats and it performs just like you would expect. There is nothing much more I can say performance wise other than it works. Use either 144 or 440 or both. If you noticed I put duplexor in both the pros and cons. The reason is because it’s great that you just one connection to the radio but you will have loss at the duplexor. I would assume the loss isn’t much at all so I wouldn’t be to concerned. When you assemble both the VHF and UHF side of the beam, it turns into quite a bulky object and would be harder to transport inside your car. Not saying it’s impossible but you would most likely have to break down one band of the antenna. Whenever the Arrow antenna is mentioned, the Log Periodic by Elk Antennas is also mentioned and vice verse. The antenna is known as a log periodic which is a little bit similar to a Yagi. Instead of one boom, It uses two booms which the elements that are attached to each boom are 180 degrees from the elements on the other boom. In a simple way I can put it is that it’s a bunch of dipoles of different lengths. When the signal enters the antenna, it will find the best pair of “Dipoles” for that frequency and the other pairs help direct the signal. Well I didn’t. I didn’t think it was worth it. The antenna is made with some quality parts. The Booms are thick walled aluminum tubing. They are spaced part using plastic spacers and plastic bolts and it has tapped holes along the boom with #10 screws to hold the elements. The boom is mounted/supported by two different grades of PVC tubing. The PVC used for mounting is schedual 40 and the other appears to be electrical conduit. The elements are also aluminum tubing that appears to have been either wet or powder coated with vinyl caps to protect the ends. They also have pressed in threads (10-32). They are high end tent poles. Included is a Handle made from PVC tubing that has a foam grip fitted to one side. This handle allows for portable ops. I priced everything out as if you didn’t have any of this material laying around the house and you started from scratch. Just based on materials alone, It’s cheaper than if you were to purchase one. Even though the materials are cheaper than what it’s being sold for, there is quite a bit of work that has to go into this antenna. One of the booms will have to be machined for a notch to allow the SO-239 connector to sit flush. There is also a LOT of drilling and tapping going on. That means you need a drillpress that is almost perfectly 90 degrees and fixtures/jigs available to drill nicely through round stock. If you don’t have the time or you highly value your time, I can see 4 or so hours in manufacturing and assembly. If you wanted to go all out and powder/wet paint the elements, then you are add more time and costs. Once again, I don’t have the equipment to give you a proper assessment of the antenna. The following evaluation is just from my personal observations. I got the antenna mostly un-assembled in a bag. I am not sure how it comes from the factory as this is also a used antenna. Assembly is easy with this antenna. The elements and boom are marked with different colors. All you have to do is match up the colors and screw them to the booms (Yep, still calling it that), connect the coax and away you go! I was able to receive some Sats, and hit some distant repeaters with my HT. I also mounted this to my simple TV rotor in my attic and used it with my FT-1900R. 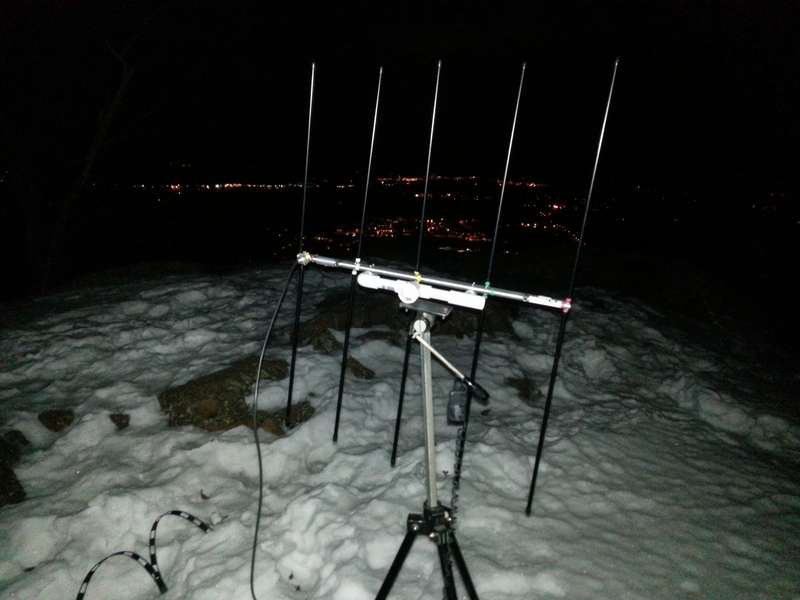 I even did a night time SOTA activation with it. Worked quite well. 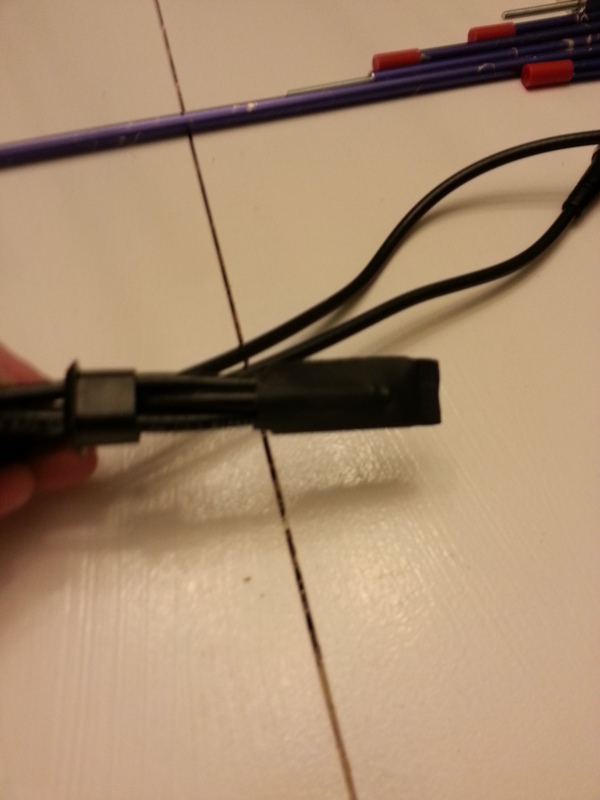 Even though the antenna works and does a great job, The use of PVC just makes me feel that the build quality is… meh. It has a home-brew feel to it, that’s all. When hooking up the coax, you have to keep at least 8″ of the coax 90 degrees from the boom as suggested on their website. In order to get the most out of this antenna, you would have to make some sort of fixture to mount the coax correctly which could be a hassle depending on how you’re looking at it. Cue the banjos and setup the octagon because we have a fight on our hands. Well… Not really. There is no winner and there is nothing that would make one WAY BETTER than the other. They both have their unique features and they both pretty much perform equally in my book. I like the Elk because it’s not as bulky and can handle more power but I like the Arrow because it doesn’t use Plumbers\Electrical PVC and it’s easy to adjust. If push came to shove and I had to make a choice, I would lean toward the Elk. If they redesigned the boom holder/mount using something other than PVC tubing then I would prefer the Elk over the Arrow. 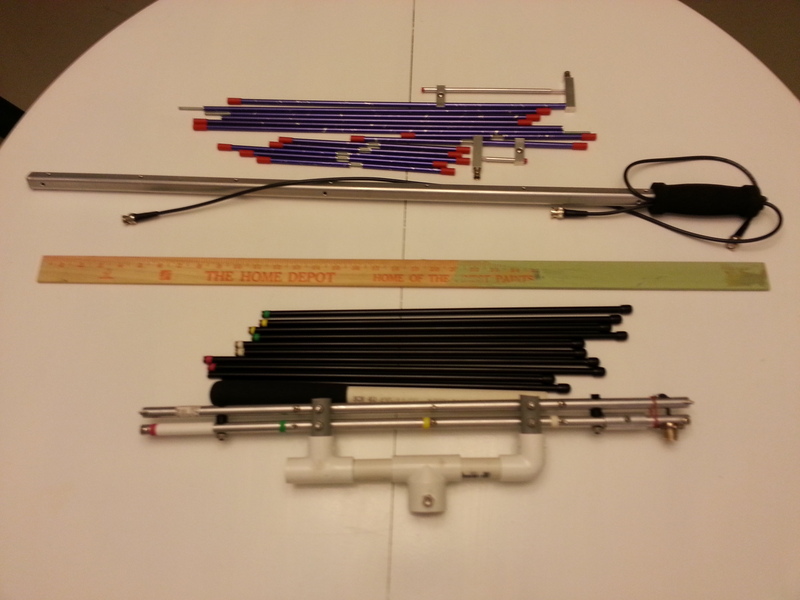 Here is a photo of both the antennas un-assembled. At the point of taking this photo, the Arrow still has a one piece boom. They both pretty much take up the space if the boom was split on the arrow. Here is the duplexor that is located within the handle of the Arrow. Wasn’t going to cut the shrink wrap to show the circuit but it’s no secret. the plans are out on the internet. Here are both antennas assembled. You can see that the Arrow is bulkier due to it’s cross polarization and it’s a bit longer than the Elk. But I will say that the arrow “Feels” lighter. I wouldn’t be holding either antenna for an extended amount of time. Here is the “Split Boom” modification I did to the arrow antenna. This is available as an option from Arrow Antennas and I would suggest spending the extra money to have it done for you. What’s great is even though arrow sells a split boom model, they published the modification to make your one piece boom into a split. I followed the directions on the site except for the angle. 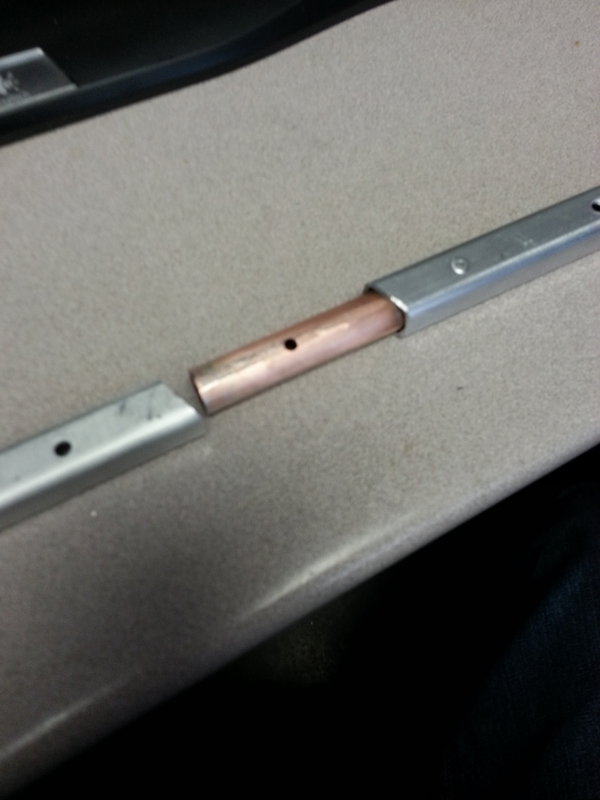 I used a piece of 1/2″ plumbing copper pipe. I should have turned it down in the lathe as it was a really tight fit. Once I got the copper pipe a couple inches in the boom, I drilled a hole through the boom and tube and used aluminum pop rivets to secure the copper tube. Once I got the other end of the boom to slide on the copper pipe and meet the angle, I drilled a hole through copper tube using the hole for the first director element for the UHF side of the antenna. This way when you thread the arrows through the boom and tube, it will “Lock” the booms together. Nice move on arrows part. Overall there is no clear winner. They both have their strengths and weeknesses. My personal preferance would be the elk even though I wouldn’t mind the arrow at all. Tasters choice I guess. I presently have the Arrow II, although I am interested in an Elk as a possible purchase. One thing I do with the Arrow II for tripod mounting or more power is to take off the duplexer and run a 6 foot BNC coax to the antenna. This works fine for using it on a tripod. For a longer run, I simply use a converter to longer coax, such as RG-8X or RG-58. This allows you to be a great distance from the antenna, or to mount it higher. I just recived my Elk today. I am VERY pleased with it. I love how light weight compact, and easy to assemble it is. No needing a duplexer is a huge bonus. The performance is great. I was able to hit a repeater I was unable to hit with an Ed Fong J pole. I personaly think the PVC is a plus not a minus. Although it does lend a cheap DIY feel to the antenna; it makes it easy to mount. I was able to quickly put a temporary mast with some PVC pipe, fiberglass military mast, and a lantern tripod. The current owner of Elk gave a presentation at our last ham club meeting. These are made in his garage not some fancy factory. So I am not bothered by the fact that it’s less than perfect. A slightly unevn cut on the PVC pipe doesn’t impact it’s perforamce. I haven’t tried the Arrow so I can’t compare. But from what I have seen of the arrow online; I think I will stick witht he Elk. Good Afternoon, i wonder if you would have measurements of this antena Elk Log Periodic dual Band. i would very much like to be able to pass this knowledge on to the Scout group that i assist im area of Amateur Radio. Thank you in advance. 73. I ended up buying the Elk because of the polarization. The Arrow 2m and 70cm elements on the Arrow are 90 degrees apart, so it would not make a handy dual band antenna if mounted on tripod while camping or something like that. It would make it hard to monitor both bands at once also. Anyway, I didn’t see much focus on that aspect but it was the tiebreaker for me personally. If it wasn’t for that, keeping the coax at a 90 from the book would have turned me off from the Elk. Next Next post: NT1K Op-Ed: The Start!